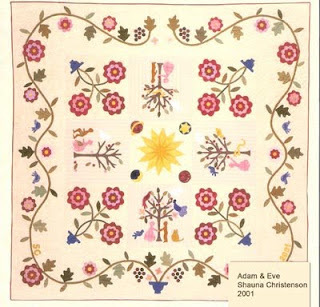 Adam & Eve, appliqued by Shauna Christenson, 2001, 84" x 84"
Designed by Barbara Brackman and Karla Menaugh from 19th-century quilts. 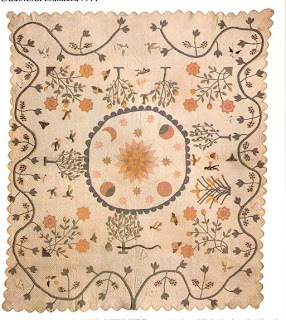 Our Sunflower Pattern Co-operative was a group of women with various talents working together to reproduce vintage applique designs. My talent is researching and drawing the patterns. Among Shauna's many talents is applique. Karla's talent with this pattern was editing and publishing. I'd been collecting photos of quilts in this Garden of Eden design ever since I realized there were two similar quilts at the Smithsonian Institution and the Johnson County (Kansas) Museum. Gift of Dorothy Diffey Beldsoe in memory of Laura Doty Diffy. Maker unknown, purchased in Fort Smith, Arkansas about 1900. By Sylvia S. Queen (1804-1896), probably in LaPorte County, Indiana. Estimated date 1850-1880. This quilt has been over dyed a purplish gray, accidentally or deliberately. The similarities in this pair are the human figures telling the tale of Paradise, Eve's encounter with the snake and the banishment from Eden. 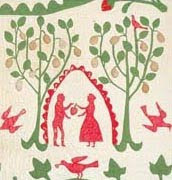 In both the Victorian-era quilts the figures are clothed, Eve in a hoop-skirted silhouette. Also similar are the large multi-lobed florals and the winding grape vine. The Smithsonian believed that the two quilts must be by the same person---Sylvia Queen---but that is assuming too much, like saying that Mary Evans made all the Baltimore Album quilts. I drew the pattern for Shauna's quilt by combining images from the quilts above. 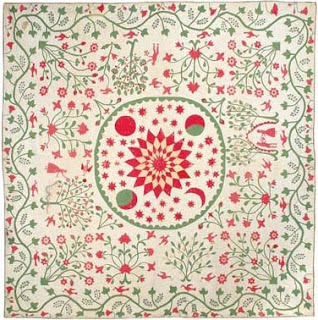 Five years later Doyle Auctions sold this quilt for $7,000 in 2006. At points north, east and west are human figures telling the Biblical story. The center with the solar system is quite similar to the Smithsonian's. It looks to date from 1840-1880 based on the fuzzy photos. Again the grape vine border and flat multi-lobed florals frame the center. The Pilgrim-Roy Collection once had a fourth quilt in this group with the same solar system center enclosed by a scalloped circle. Eve handing the apple to Adam is nearly identical to the version above. I don't have an overall photo. 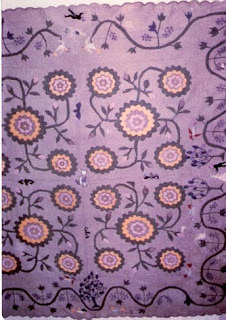 What makes this quilt different from the others is the paisley-shaped Broderie Perse applique shapes. Based on the blues and chintzes in the detail shots I'd say this is the oldest of the four, possibly 1840-1860. 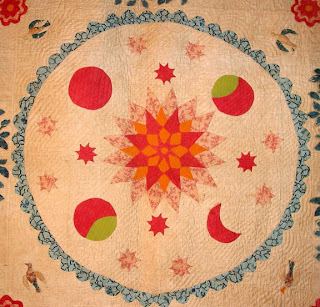 If there are four of these quilts with the hoop-skirted figures and the optional central solar system, there may be more. Right now I would have to conclude it was a pattern passed around hand to hand in the mid-to-late 19th century. A late-19th-century version at Colonial Williamsburg. Oh that was a wonderful post! I love that quilt! Thank you for sharing where to buy the pattern as that was my first question when I saw this! I am just amazed by the artistry of those quilters!! 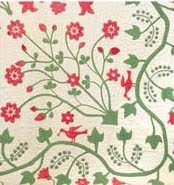 These days it is easy to be a goal oriented quilter and designer and overlook the enjoyment of the process of quilting! I wonder how many endless hours must have gone into making these works of art! As usual, your post is so informative and inspiring! I really love those quilts. 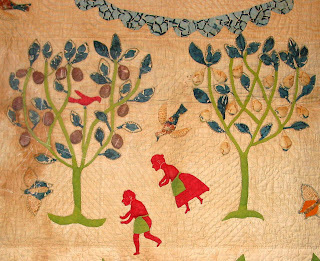 I love looking at the quilt index and online museums to see applique works. world, we forget there were quilters who took those many years to design, make and quilt beautiful quilts. Perhaps if we could give up TV, Texting, Cellphones, extra car trips etc - we could put more of oursleves into our quilts? Not sure.